Audie Leon Murphy (June 20, 1925 in Kingston, Hunt County, Texas – May 28, 1971 Brush Mountain near Roanoke, Virginia), was an American actor and military person who fought during World War II. He was given the Medal of Honor. Murphy was of Irish descent. His was the son of Berry Emmett Murphy and Josie Bell Killian. He grew up on farms near Farmersville and Greenville, Texas. When his father left the family, Audie stopped his studies at primary school in fifth grade to help support his family. Murphy joined the Army in 1942. His first assignment was being sent to Morocco as a replacement in the 3rd Platoon in 1943. Audie Murphy was very good in several battles. In Italy, his abilities as a combat infantryman earned him promotions and decorations for his heroism. After being wounded in combat, Murphy was removed from the battlefield and promoted to Lieutenant. The Lieutenant General Alexander Patch, commander of the Army, gave him the Medal of Honor. Audie Murphy also received 33 U.S. medals for his courage and heroism in battle. 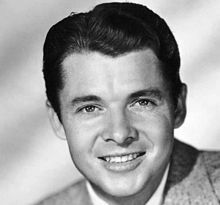 Audie Murphy began his acting career in 1948, in the comedy movie Texas, Brooklyn & Heaven. It was directed by William Castle. Murphy has been one of the best known Hollywood actors in westerns movies. He played the role the legendary "Billy the Kid" in The Kid from Texas (1950) directed by Kurt Neumann, and then playing another legend Jesse James in Kansas Raiders (1950), by Ray Enright. His greatest successes were Westerns was The Duel at Silver Creek (1952), by Don Siegel, Gunsmoke (1953) and Drums Across the River (1954) directed by Nathan Juran, Destry (1954) and The Guns of Fort Petticoat (1957) directed by George Marshall, Night Passage (1957) with James Stewart, The Unforgiven (1960) with Burt Lancaster, Gunfight at Comanche Creek (1963) one of his best movies. Murphy also had a television series Whispering Smith (1961). In it he played the role of Tom 'Whispering' Smith, for 26 episodes of the TV Western. Another of his great works for the movies were war movies, such as To Hell and Back (1955) by Jesse Hibbs. It was a biography of his story during World War II. "Medal of Honor recipients on film". Archived from the original on December 16, 2012. Retrieved September 29, 2010. "Audie Murphy - A Mini Unit Study". Retrieved September 29, 2010. "Audie Murphy: One-Man Stand at Holtzwihr". Retrieved September 29, 2010. "Third Division photos and Murphy bio". Retrieved September 29, 2010. "Dallas Scottish Rite: Medals located at Dallas Scottish Rite Museum". Retrieved September 29, 2010. This page was last changed on 29 March 2018, at 08:54.